This PR was squashed before being merged into the 4.3-dev branch (closes #28919). | Doc PR        | n/a ? Quite often when attempting to debug issues with JSON requests sent to a Symfony API, I use the Web Profiler to check the request content. More often than not the request content isn't easily readable (99% of the time it's all stuck on a single line and impossible to read). 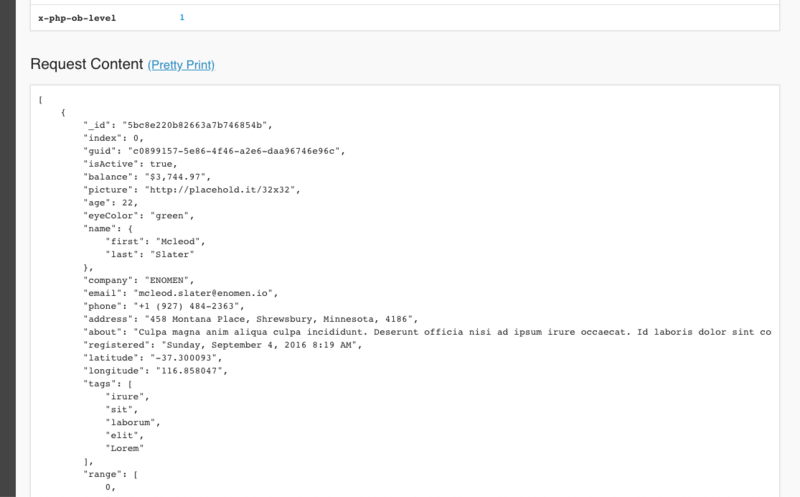 I always find myself copying + pasting the content into a random online tool to have it "pretty-print" the JSON. Usually this isn't an issue, but can be annoying when offline. There's also the security issue of sending entire JSON payloads to a third-party server just for formatting 😳. Alternatively, maybe developers  copy+paste into their chosen editors and this PR is all a waste of time — I hope not 😛. This PR adds "Pretty-Print" JSON functionality straight into the profiler. We can use `collector.requestheaders` to detect if the request was JSON and conditionally show the Pretty Print button. When the button is clicked, we format the JSON from the "Request Content" card. ## What does it look like? - Is `JSON.stringify(JSON.parse(content));` the safest, most efficient way to do this? - Should the "Pretty Print" button be in-line next to the "Request Content" header? I couldn't find a pattern for this sort of thing elsewhere in the profiler. - Do people want JSON formatted with 4 spaces, would 2 spaces be preferred? Should this be a configuration option stored in localStorage (such as the light/dark theme configuration)? Depending on how this is received it could be extended to support formatting different request content-types (e.g. XML formatting) — I assume. - [x] Gather feedback and decide where to perform the pretty-print: [server-side, or client-side](#28919 (comment)).